With the Super Bowl coming up this Sunday, I thought it would be the perfect time for my longtime friend, Chef John Michael Lerma to share with us his fabulous Crock Pot Apple Pie recipe. This recipe will be the first of many of John Michael’s amazing recipes and tidbits that he will be “exchanging” with us here in our little creative corner of the Blog world. John Michael resides in St.Paul, Minnesota and is insanely creative, hysterically funny, wonderfully talented and a pure joy to be around. He has several fabulous cookbooks under his belt, is a regular featured guest on Twin Cities Live and has made multiple Food Network Appearances. 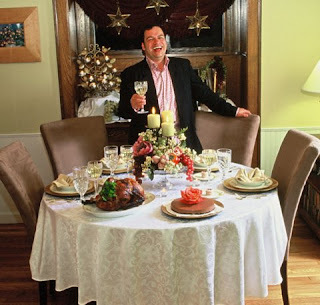 He also hosts regular cooking classes and tours in Tuscany…. Italy! The great thing about this particular recipe is that we get to watch John Michael make this yummy recipe in action on Twin Cities Live. I am posting the recipe at the end of today’s posting entry for you to scroll down and print out. If you have any questions about making this recipe or any comments for John Michael, you can post at the end of this entry in the comment section and John Michael will respond. 1. Lightly spray bottom and sides with slow cooker. Toss apples in a large mixing bowl with Apple Pie Spice. Gently spoon apple mixture into slow cooker. 2. In a medium mixing bowl combine milk, softened butter, sugar, eggs, vanilla, and ½ cup of the Bisquick. Spoon over apples. 3. Combine the remaining Bisquick with the brown sugar. Cut cold butter into Bisquick mixture with a pastry cutter until crumbly. Sprinkle this mixture on top. Again, please let us know if you have any questions or comments! Have a wonderful weekend and I look forward to giving you some fun Valentine’s Day crafts for kids next week! Someone suggested today adding a few small squares of caramels into the pot! Not that the recipe needs any help whatsoever but a little bit of caramel added sounds yummy too! Enjoy! Johm Michael, will this work with peaches? I talked with John Michael and he said peaches would work, either fresh or if you use canned, make sure you drain. Someone else I work with mentioned to me on Friday that she was going to try it with fresh peaches. Mmmmm..
Yummm! I can't wait to make this!